Thinking of traveling abroad? This truly Asian island down south might interest you, with its cultural delights and natural wonders. Take a vacation to a place that surreally feels like home but guarantees a novel, pampering experience nonetheless. Head to this not-quite-'Pinas pit stop down south and discover Sabah, Malaysia. Although it's set quite apart from the widely-visited Malaysian cities of Kuala Lumpur and Penang, Sabah still boasts of being truly Asian with its rich mixture of culture and natural treasures. While Sabah is just several hours away by boat from the south-western tip of Palawan, we suggest that you hop aboard a plane and get there in just a little over an hour from Manila. Once you're there, you'll be greeted by Pinoy-looking peeps speaking in a language almost like ours. Still, despite the seeming similarities, get ready to experience something new. Whether you feel like holing up in your hotel for some serious R&R or exploring the wild outdoors, Sabah can offer you complete satisfaction of your hiatus needs. We suggest you book yourself in any of the Sutera Estate resorts and customize your vacation to the type of traveler you are. If the sight of surf and sand are enough to complete your notion of a dream vacation, Sutera's island resorts are the place to be. Sutera manages two islands off the coast of Kota Kinabalu, Manukan and Mamutik. Ferries can take you to and from the two islands from the Sutera Harbour jetty port. If you'd rather stay longer, Sutera Island resorts have fully-furnished cabanas you can rent for overnight. There are a few cabanas that can house families and groups, while the cozier ones provide an intimate beach paradise for lazy couples. What to do there: Aside from scoring yourself a tan that'll make you the envy of your officemates back home, make sure you make the most of the treasures down below. Go scuba-diving if you can, or at least snorkel and enjoy the underwater scenery. Trust us, the corals and fish (even just five feet from the shore) are enough to keep you in the water for a couple of hours. After your snorkeling workout, treat yourself to a hearty buffet lunch-very similar to our Pinoy beach barbecues. Enjoy bandehados of seafood, veggie dishes, inihaw na manok, and liempo. Stick to the city if the wild outdoors isn't your cup of tea. While the Sutera Harbour Resort is located 10 minutes from the airport and practically right smack in the Kota Kinabalu city center, it still provides you with the in-city escape you need. Choose between the two Sutera Harbour Resort Hotels. The Pacific Sutera Hotel is more like the high-rise hotels of any metropolis, while the Magellan Sutera Hotel is a Balinese-inspired complex of more laidback in-city lounging. What to do there: Enjoy the amenities: from swinging your clubs in their 27-hole golf course with day and night golfing, or making the most of the Marina club services (tennis courts, bowling alleys, Olympic-sized swimming pools, and even videoke bars), to lounging by the beachfront of any of the two hotels or getting pampered at the Mandara Spa. Or head off to the city in the hotel's convenient hourly shuttles. Join a city tour and see the sights of Kota Kinabalu. Contact Popular Express Travel, Sabah Tourism Awardee for best tour operator in 2001 and 2002 (tel no. 60-88 214692/214693/225291). While exploring Kota, make sure to visit the Filipino Market. Yes, you read that right. It's a tiangge-type market where they sell native products (some similar to ours). Cosmo hint: Speak in Filipino. Since Malays can more or less understand our language, you can get as much as 50 percent off on your buys. If things get too hot to handle, hie off to the mountains and enjoy the Baguio-like weather of higher altitudes. 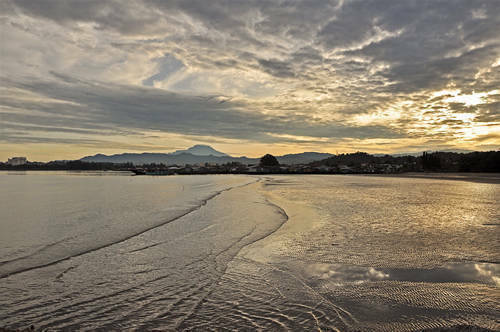 Around two hours away by land from the city center are Sutera's mountain resorts, Kinabalu Park and Poring Hot Springs. Ask your concierge at the Sutera Harbour resort if there are day trips to Kinabalu Park. If you want to hide in the highlands and stay there a bit longer, you can check yourself in at one of the mountain cabins. Some cabins are perfect for the backpacking mountaineer, while the others will suit those who want a more leisurely mountain stay. What to do there: One of the top attractions of Sabah is Mt. Kinabalu, known to be the highest mountain in Southeast Asia and standing 4,095.2 meters above sea level. Many tourists have tried to conquer this mountain, witnessed sunrise atop the peak, and lived to tell their life-enriching tales. Got a couple of days to spare and are willing to take the challenge? Try trekking up the mountain and ready yourself for the experience of a lifetime. If making it to the summit is a bit too much work for a vacation, we suggest you go on the Canopy Walk near Poring Hot Springs. This trek leads you to a rainforest and a hanging bridge. Suspended 50 feet above the forest floor, it's the pinnacle of your rainforest visit and will be an exciting adventure to try. Make sure to have your photo taken as you cross the bridges-proof that you've conquered your fears! After your mountain adventures, relax in a tub of sulfur-rich water at the Poring Hot Springs. A relaxing dip will rid you of your stress and ensure that your vacay is definitely as rejuvenating as it should be. For inquiries, visit the Malaysian Airlines office at Unit 25-B The World Centre, 330 Sen. Gil Puyat Ave., Makati City, call (02)896-8763 to 65, or email malaysia@skyinet.net. To contact the Sutera Resorts, log on to www.suteraharbour.com. For special packages and promos, contact Destinations Unlimited, Unit 2B Lydia Building, 39 Polaris St. Bgy. Bel-Air, Makati City, call (02) 896-4811.